One of America's most beloved holiday pastimes involves bundling up and heading out to ooh and aah at all the colorful twinkling holiday lights. 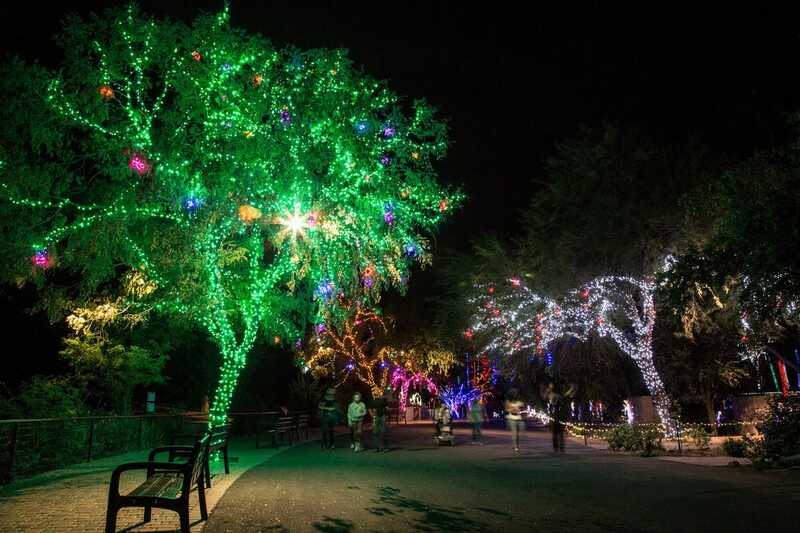 Zoos across America are getting in on the fun with their own festive seasonal displays. 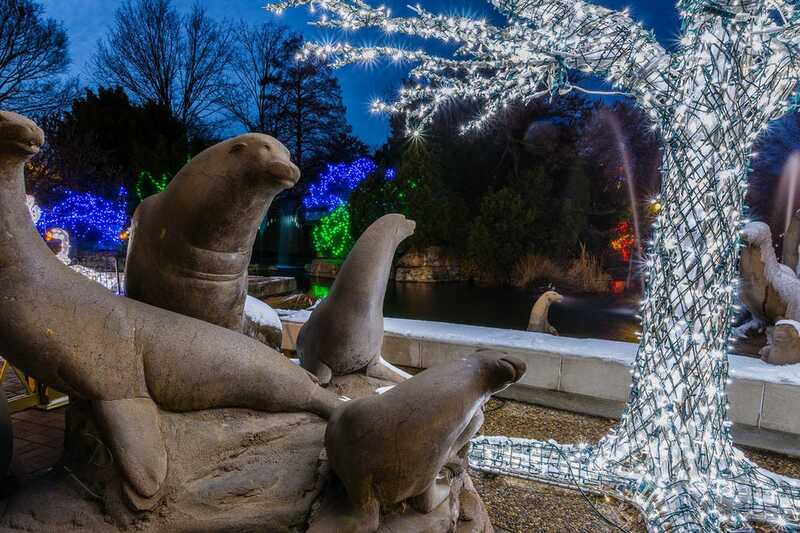 Once the sun sets and the animals go to bed, these 10 U.S. zoos – voted by our readers as the best from a pool of 20 nominees – celebrate the season with some of the top lights displays around. 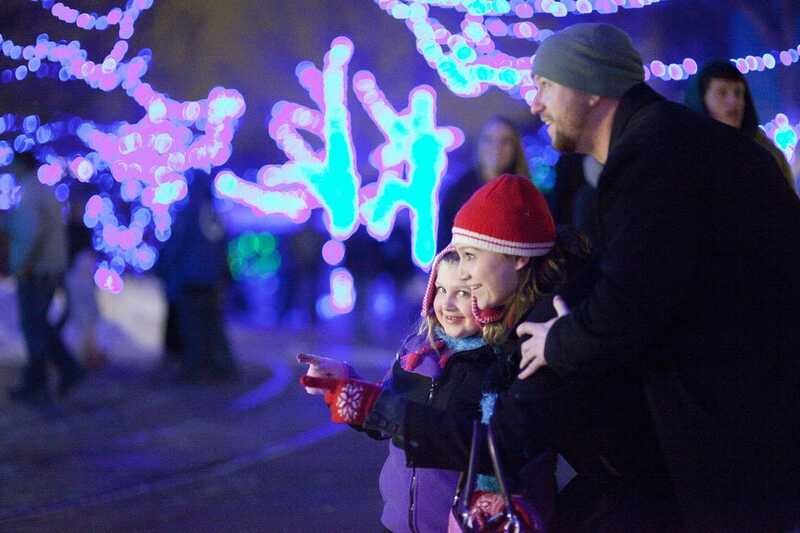 Highlights of the Toledo Zoo's annual Lights Before Christmas celebration include nearly 70 miles of lights (over half are LED), bumper cars on ice, a three-lane ice slide, plenty of food and, of course, visits with Santa. Visitors can warm up in the theater with a show by Douglas the Talking Tree and share the spirit with various groups of carolers. 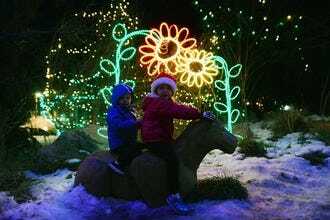 At Wild Lights, the holiday lights festival put on by the Detroit Zoo, visitors can gape at more than five million LED lights and some 200 animal sculptures or watch Rudolph the Red-Nosed Reindeer in a 4-D theater. 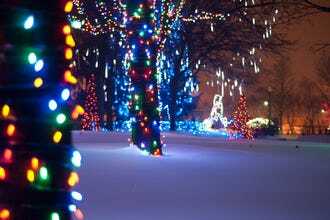 Wild Lights also offers live entertainment, ice carving, food, photos with Santa and various arts and crafts activities. 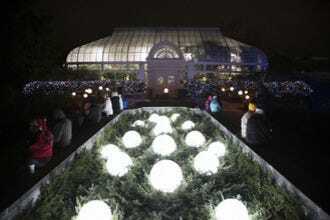 Visitors experience a winter fairyland in St. Louis at the annual U.S. Bank Wild Lights festival. The St. Louis Zoo gets decked in half a million glimmering lights in a variety of displays, including a gingerbread village, Fantasy Butterfly Garden, Swan Lake and Starry Safari. 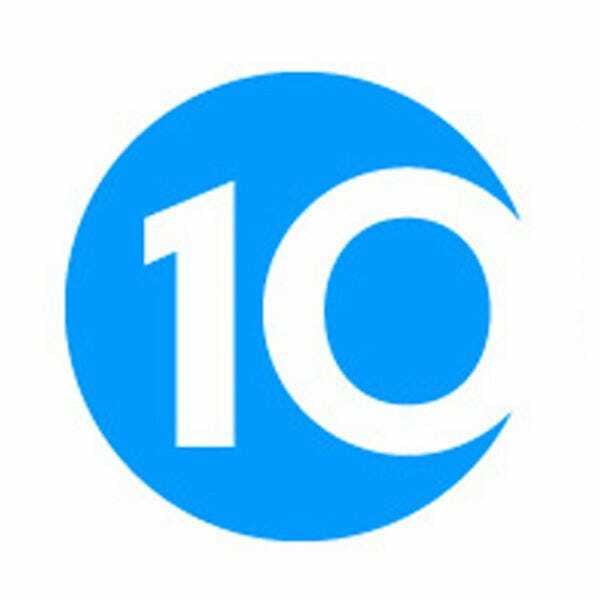 Highlights include fireside stories, s’mores, ice carving demos, costumed characters and the chance to visit some of the zoo's critters, including Kali the polar bear at McDonnell Polar Bear Point. 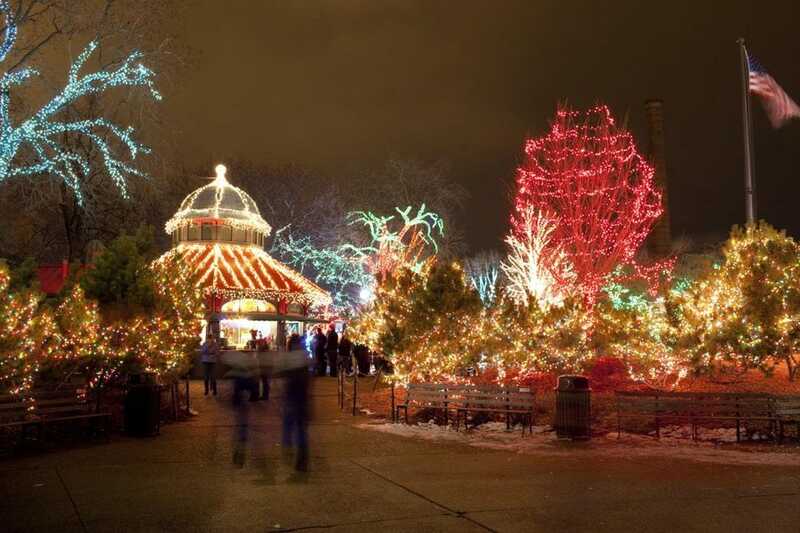 Christmas at the Zoo at the Indianapolis Zoo was the first zoo lights festival in the nation, starting in 1967. Since then, the event has grown, and it continues to be a leader in offerings, including a 4-D theater, train rides, shows, carolers and a carousel. Christmas at the Zoo is illuminated entirely by LED light displays, making it more environmentally friendly. Cheyenne Mountain Zoo, situated in Colorado Springs, hosts its Electric Safari to celebrate the season. The display comprises 85 twinkling light sculptures spread across 50 acres. Warming fires dotted throughout the displays keep fingers warm, and some of the zoo's indoor animal exhibits remain open during the event, giving guests the opportunity to observe some critters as well. 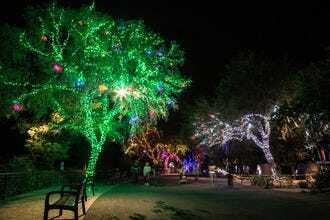 Visitors gape at millions of holiday lights and hundreds of different displays, including a three-story-tall holiday tree, at the Phoenix Zoo’s ZooLights festival. Event highlights include 3D light sculptures of tigers and stingrays, moving light shows set to music, ice sculptors in action, an interactive talking giraffe and a carousel. Some animals will be out to celebrate with guests, including stingrays in the touch tank. 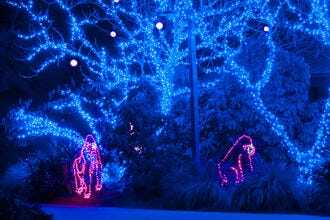 The Riverbanks Zoo's Lights Before Christmas is Columbia’s longest-running holiday tradition, spanning more than 25 years. 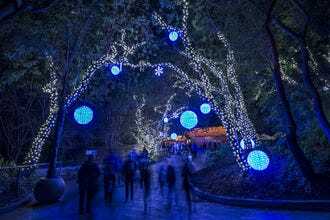 At this annual event, the zoo glows with animated images and nearly one million twinkling lights, while Santa visits with guests in his village. Visitors can gather around the Jingle Bell Bonfire, sip hot chocolate and eat warm marshmallows, or father around the 20-foot-tall Christmas tree that “dances” to holiday music. Many animals will be snoozing, but some of the night owls stay awake for the party, and some indoor exhibits remain open. 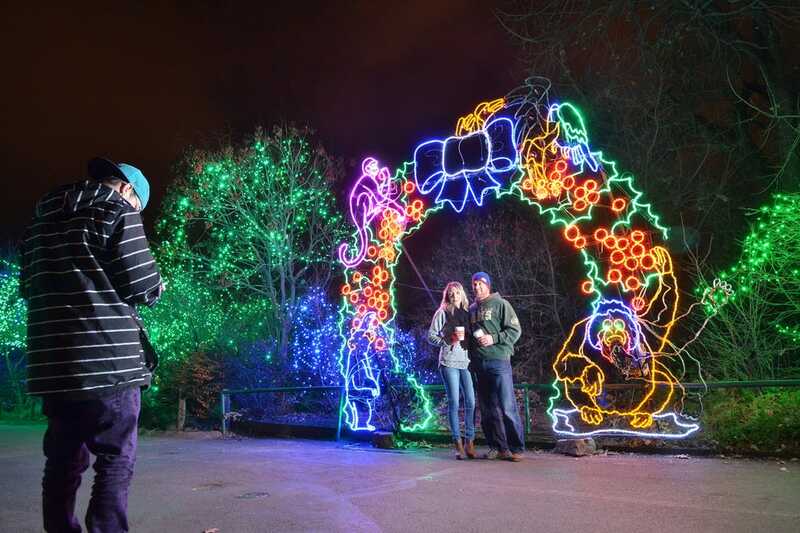 The Denver Zoo’s festive Zoo Lights celebration nearly doubled in size last year and will again fill 70 full acres in 2016. 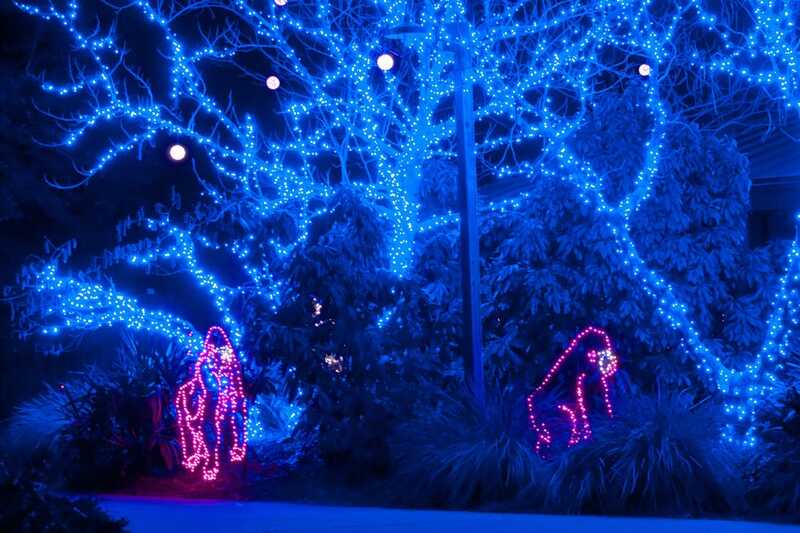 Although some of the zoo’s resident animals will be sleeping when the lights come on, visitors can marvel at more than 150 illuminated, moving animal sculptures throughout the campus, like "monkeys” swinging through the trees. Zoo Lights also includes entertainment, a month-long Lantern Festival and visits from the jolly ol’ man himself, Santa. While most of the living animals at the L.A. Zoo sleep the night away, electric, glowing animal displays take over the grounds, during the annual LA Zoo Lights event. Visitors can walk past impressive 3D projections, lasers and lights as the entire zoo is transformed into a glowing, cheerful exhibit, complete with a water show and music. Visitors may even get a chance to meet Santa with his real reindeer. 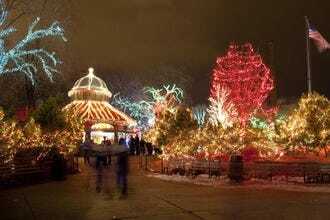 The Lincoln Park Zoo in Chicago offers an annual holiday light display that is free and open to the public. Across the 35-acre zoo, visitors can see glowing, musical light shows, 3D displays and live ice carving. They can take pics with Santa, sip on spiced wine, ride a carousel and train, go ice skating and maybe even see some live animals, if they’re awake. 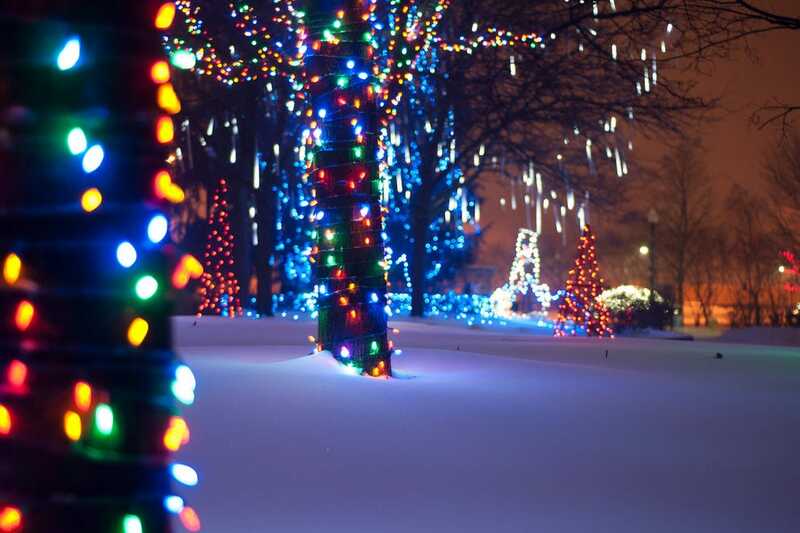 Complimentary 3D holiday glasses bring the lights displays to life. Lights Before Christmas at the Riverbanks Zoo - Columbia, S.C.
Other nominated events included Zoo Lights at the Memphis Zoo, Wildlights at the Columbus Zoo, Zoolights at the Point Defiance Zoo, PNC Festival of Lights at the Cincinnati Zoo, Zoo Lights at the Houston Zoo, ZooLights at the Oakland Zoo, ZooLights at the Oregon Zoo, ZooLights at Smithsonian's National Zoo, ZooLights at Utah's Hogle Zoo and WildLights at the Woodland Park Zoo. 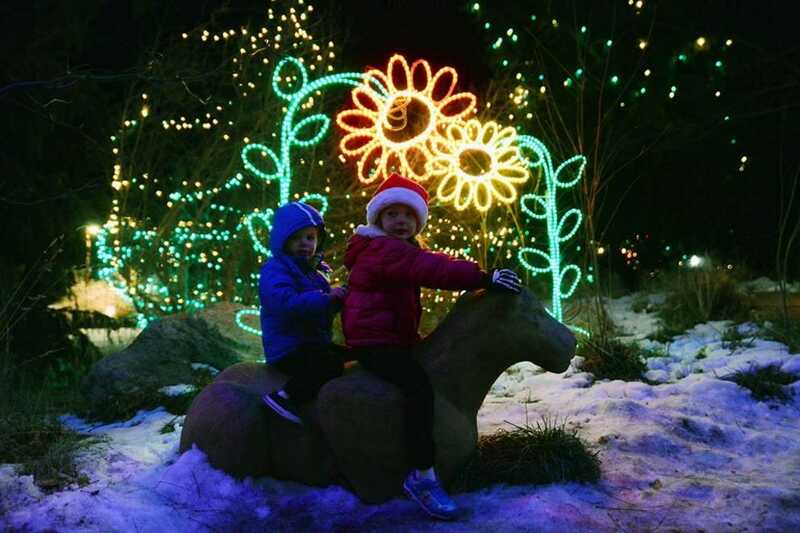 Congratulations to all our winning zoo lights, and check out our list of all 2016 holiday zoo events to find a festivity near you. 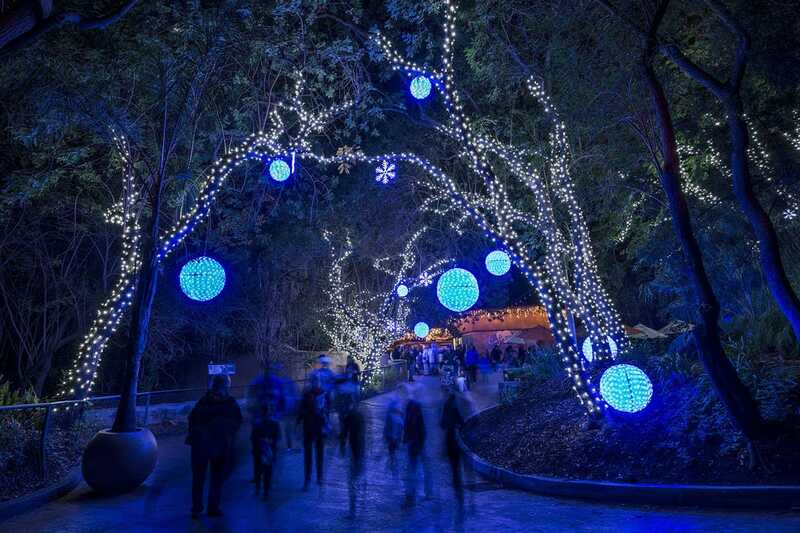 The 10Best editorial team selected the 20 nominees for Best Zoo Lights from a list of 2016 events provided by the Association of Zoos and Aquariums (AZA) is a nonprofit accreditation organization.